Babies come to their families in different ways. Sometimes, the stork brings them. In our case, our adoption profile letter did. It was how our children’s birth families first discovered us and the reason why they eventually chose to place with us. Even though we couldn’t be happier with the way that things worked out, writing our letter was no easy task. At times, it was even harder than the wait. 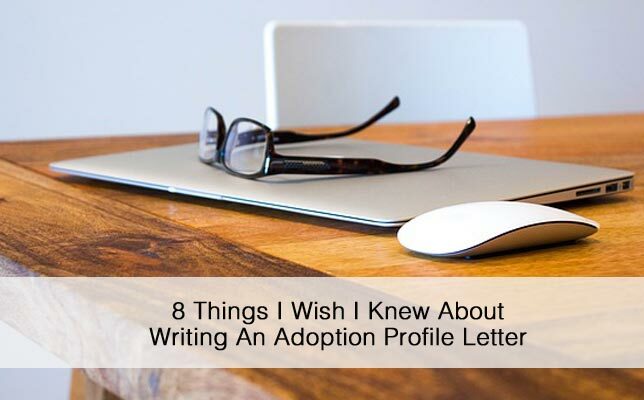 Here are 8 things I learned about writing our adoption profile letter that may help you with yours. When I first dove into writing our letter, I looked at it as a story about us. So I focused on topics that were important or memorable for us: for example, our wedding and vacation trips. Meanwhile, topics that I didn’t know much about — open adoption and parenting — I avoided. Bad move. Expectant mothers aren’t interested in hearing about where you spent your honeymoon or seeing photos of you relaxing on a beach. But they are keenly interested in finding out what kind of parent you’ll be and how you plan to raise your child. So when you sit down to write your letter, don’t forgot who your reader is and what she’s looking for. The amount of information you need to fit into your letter is overwhelming. There are so many topics you need to touch on: your personality, your interests, your family, your home, your values, not to mention your thoughts on adoption, parenting, and openness. But if you think it’s difficult for you, just imagine how a prospective birthmother must feel after she’s read three or four letters just like it. Think of your letter as your introduction. Don’t load it up with all kinds of unnecessary details. Pick and choose the most important details and save everything else for later. The content of your letter is important, but so is the tone. The way you convey your information is just as important as the information itself. Avoid jargon and use simple words. Set yourself apart by letting your personality shine through. The goal isn’t to sound like everyone else. The goal is to sound like you. One of the biggest pitfalls that waiting parents run into when writing their profile is investing all of their time and energy into the writing process. Words are important, of course, but if they’re all you focus on you, you won’t get very far. Photos are just as important, if not more so. They’re the first thing that an expectant mother will see when she comes across your profile. So take the time to go through your pictures and choose them carefully. Each one should help you put your best foot forward and relate back to things in your letter. Don’t underestimate the power of first impressions. They count — often more than you think. That’s why ensuring that your letter looks as good as it sounds is key. Make your letter mobile-friendly by including lots of white space, sub-headings and short paragraphs. With the proper formatting, your letter will not only be easier to read, it will be easier to write as well. Writing your letter is an important part of the networking process. But it’s only the first stage. You still need to get it out there where prospective birthparents can find it. Sharing it on social media can help you spread your message. Facebook, Twitter, Instagram, Pinterest, Google Plus — they’re all great ways to increase your visibility for free. Or, if you want to give your letter an extra boost, consider targeting specific audiences by launching an advertising campaign. After I wrote the first draft of our letter I was so happy with it I was ready to send it out. Good thing I didn’t. It needed a lot of work. The saving grace is that no one ever saw that first draft. By the time we did share our letter, I had re-written it from start to finish. What I learned is that a first draft can help you get your story out. But the subsequent drafts are what will ultimately make it shine. Writing our letter was such a huge undertaking that when we finally sent it out I was expecting the phone to ring off the hook. I couldn’t bear to think that all of the time and emotion I had put into it was a waste of time. When we didn’t hear anything back, I was devastated. That experience taught me another valuable lesson. I learned the importance of being patient and keeping your ego in check. And so when the phone did finally did ring, I came to appreciate our matches a lot more than if they had happened right away.